I love helping to promote local businesses which are not only offering quality products and services, but are spending their time giving back to the community. Recently, I became aware of a wonderful kids hair salon, called Snip-its, with many locations in the Houston area. From start to finish, Snip-its is a hair styling adventure with lights, music and fun. First launched in 1995 by founder Joanna Meiseles, Snip-its has since been revolutionizing the hair care industry by creating a branded entertainment concept designed to untangle the hair-care challenges of children. 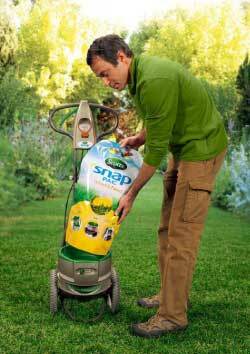 Currently, Snip-its has more than 60 locations in 26 U.S. states. The newest Houston location on South Voss Road will be the twelfth location of this franchise in Texas. Keep reading to learn more! Print off this Snip-its coupon and receive a kid's regular haircut for only $10.00 ~ Expires 4/30/12 and is good for the Houston location on S. Voss Road. With life-size characters, music and games, Snip-its has turned what was once a tedious chore into an amazing adventure, filled with fun, games and excitement. 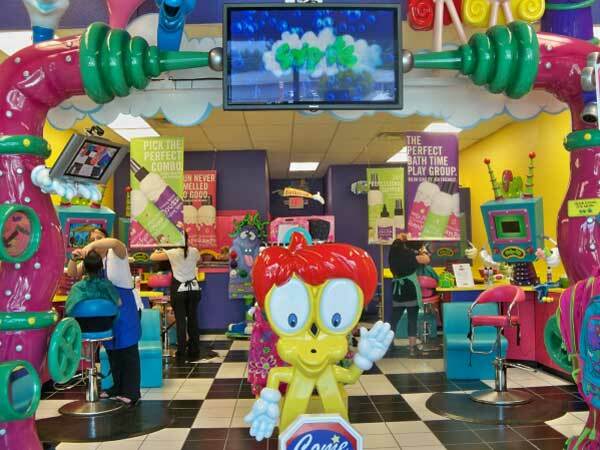 Upon entering the salon, parents and children step into a magical cartoon world of adventure characterized by floor-to-ceiling cartoon murals and splashy vibrant colors. In the waiting area, they can enjoy the Snip-its show, featuring a whimsical cast of cartoon characters; play with toys; or browse the retail space filled with selections of natural hair care products, specialty toys and gifts, and hair and fashion accessories. Each cutting station includes a special chair for parents to sit close at hand, and an entertainment station featuring custom computer games and activities for the little ones. Upon completion of the haircut, children insert a lock of hair into the "Snip-its Magic Box" for a prize. Snip-its Houston also offers a "baby’s first haircut" package, which includes a special keepsake for that first lock of hair, a first haircut certificate, and a commemorative photo and holder. Spa Party – Pampered is the key word here. The birthday child and guests wear plush robes for an afternoon of cucumber facials, mini manicures and/or mini pedicures. 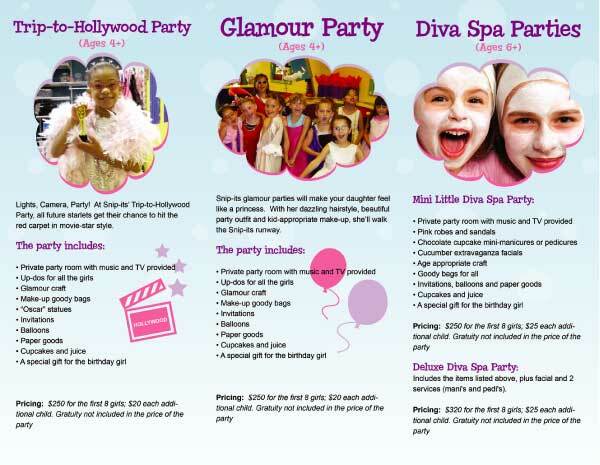 Hollywood Glamour Party – This is for the little star who belongs on the red carpet. After the birthday child and his/her entourage get their movie-star makeover with a party hair style, make-up, nails and wardrobe, they take a walk down the red carpet while surrounded by paparazzi. Rock Star Party – Kids dreaming of becoming the next Hannah Montana or Justin Bieber will love this party theme, which includes getting the "rock-star treatment" of a funky hairstyle, make-up, nails and accessories. The little Rock Star then jams to karaoke tunes with his/her biggest fans. All parties include a birthday cake, favors, and a special gift for the birthday child. "Snip-its is about so much more than getting your hair cut," said owner Alane Middleton. "It’s about creating memorable experiences that will last a lifetime for these kids." Snip-its opened the South Voss Road salon in Houston, Texas the weekend of March 23, 2012. Owned by local couple (and parents), Alane and Wesley Middleton, Snip-its will be the Houston metro area's fifth kids-only salon and will offer: haircuts; spa services; birthday parties; a retail space with hair care products, toys and accessories; and more. Snip-its recently teamed up with Disney on Ice and Sunshine Kids to give a group of Sunshine Kids a chance to become Princesses for a Day. On Thursday, April 12, the Sunshine Kids were picked up and taken to the newly opened Snip-its on Voss Road where they were pampered with princess-esque makeovers, hair styles and a karaoke style Princess Party in the event room at Snip-its. After their afternoon of princess bliss, they were taken to Reliant Stadium, where they saw Disney on Ice: Dare to Dream and then visited backstage with performers from the show. Sunshine Kids Foundation, a Houston not-for-profit, is an agency that adds quality of life to children with cancer, by providing them with exciting, positive group activities, so they may do what kids are supposed to do…have fun and celebrate life! If you're in the Houston area, then by all means check out the several Snip-its locations for more details about their upcoming promotions. And if you're not living in Houston, I highly recommend finding the nearest Snip-its location and taking your children on a hair styling adventure they'll never forget! Disclosure: I received a Snip-its prize package for posting this information. As always, the opinions expressed in this post are completely honest and objective.